The membership base now extends from Cooktown to Perth and overseas. During 1998 the membership of RAAF Vietnam Association decided that they would like to become incorporated within this association and during 2003 the membership of “Skippy Squadron” Association (former Qantas staff members who flew Department of Defence charter flights in and out of Vietnam during the Vietnam war and have been subsequently awarded the Logistic Support medal and the Australian Active Service Medal) decided that they would like to become incorporated within the association and the Blue Mountains Vietnam Veterans and Associated Forces Inc. welcomed these decisions. Because of the character of this association, it does not involve itself in any possible controversy on Vietnam or in any other matters relative to any military involvement. This association now places strong emphasis on involvement in members’, their families and/or dependant’s welfare/needs in its activities. 2. To provide welfare advice and support to assist members, their families and dependents, by way of welfare officers, to obtain evidence necessary to commence and pursue claims for compensation for disability or death suffered during Service related activities. 3. To provide relief from poverty, sickness, suffering, distress, misfortune, destitution or helplessness to persons recognisably in need of assistance. 4. To support and comply with the principles and promote the objectives of the Disability Services Act 1992. 5. To conduct the association for the ongoing benefit and welfare of Veterans, their families and dependents and also for past and present members of the Defence Forces and dependents. 6. To seek Government funding and assistance in providing support for the ongoing welfare of members and /or their families in demonstrated need of assistance. 7. To uphold the interests of all members and their dependents and to safeguard their good name. 8. To conduct the objectives without consideration of private gain for individuals or for financial gain for the Blue Mountains Vietnams Veterans & Associated Forces Incorporated. 9. To maintain public awareness of the role played, and those services provided by the Blue Mountains Vietnams Veterans & Associated Forces Incorporated. 10. To create, promote and cherish a bond of comradeship between members and to foster espirit-de-corps. 11. To honour the memory and revere those who have served and suffered as a consequence of war. 12. To promote and organise social gatherings of the members and their families. 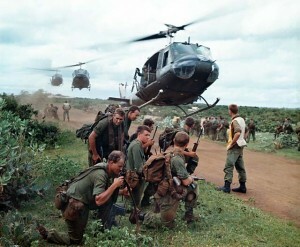 The Association produces a bi-monthly newsletter which has a circulation of over 600 members throughout Australia and overseas; the Association also conducts the largest single club annual parade and Memorial Service for Vietnam Veterans in Australia in the village of Springwood NSW, Memorial day is held on the closest Sunday to the Federally recognised Vietnam Veterans’ Day held annually on 18 August (Long Tan Day). To become a Member please complete a Membership application form or an application for Associate Membership. Please click here to read our Membership criteria. Membership renewals – Membership fees become due as of 1st January each year . Would those members who have not paid their subscription ($10.00 per calendar year), and intend to remain members of this Association, please assist your management committee by remitting their monies ASAP. If you wish to remain a member would you please advise the Secretary so that the membership database can be adjusted accordingly. Your Committee thanks you for your continuing support.